Painted the pier a matt black and levelled the pier plate and installed the wedge and telescope on it. Also laid some left over carpet in the main observatory and warm room. 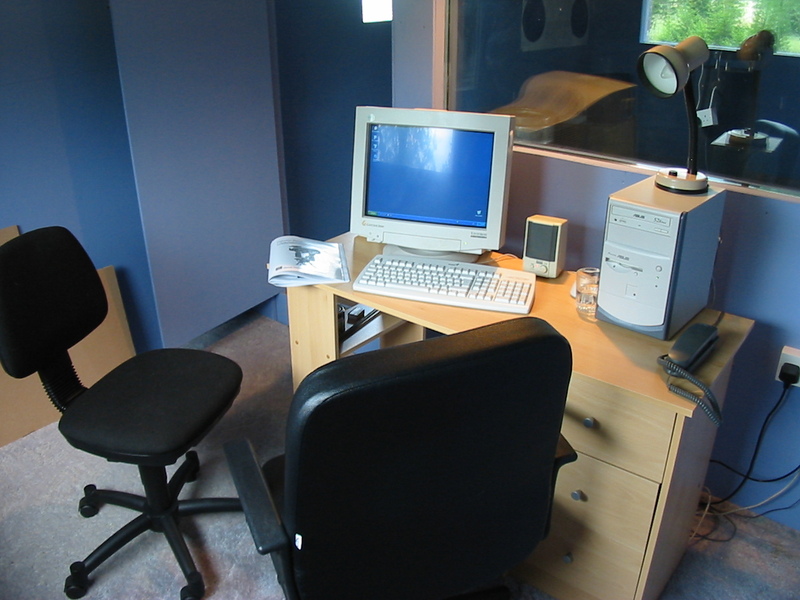 I also put up some posters and brought out the monitor, PC connection cables, eyepieces etc to the warm room. I have a SAC IV web cam which I will use initially. I also intend to purchase the Meade LPI and Autostar Suite next week, and may eventually progress to one of the CCDs available from Starlight XPress or SAC Imaging. Also made up a flat pack desk I purchased from Argos as well as a couple of office chairs. 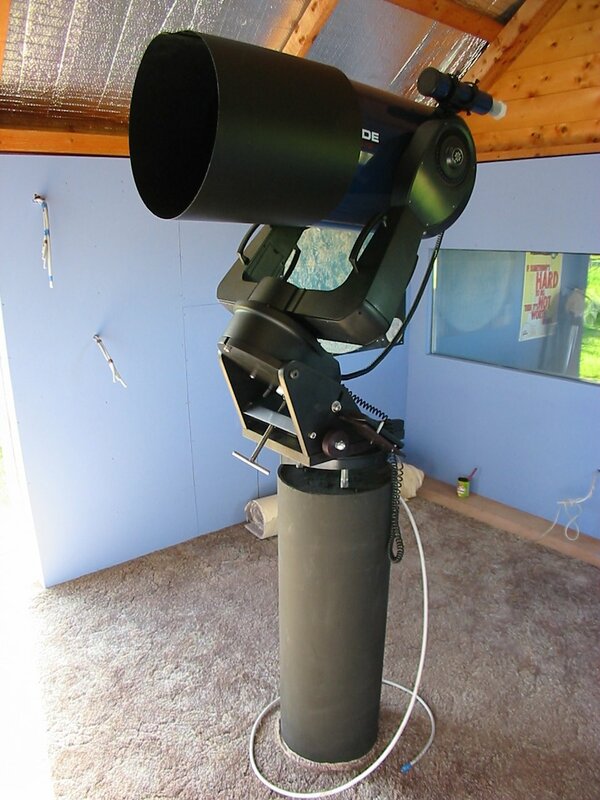 All that is left is to get the electrical wiring completed and order a computer and a solar filter for the telescope. Hopefully everything should be in place for the Venus transit. 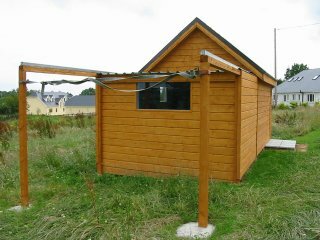 The electrician was over this evening and we got all the observatory wired up. We had to put up a temporary socket on the pier while we await a 6 gang socket which we back ordered. He also wired up a security light which comes on when I walk down to the observatory. Also got the Computer all hooked up, phone line installed, connected the PC to the scope and tested it with Skymap Pro v10. Also installed K3CCD and the SAC IV web cam. Tried to wired up the Cat5 cables and failed miserably. I'll need to get a network continuity checker to sort out the problem. As an interim solution I setup a 802.11b USB link to my Wireless access point in the house. With the observatory PC now accessible from my network, I installed an old Creative web cam on the PC and pointed it at the scope. This allows me to remotely monitor the observatory (see Webcam View in the right navigation frame). Can't wait to align the scope and achieve first light. Pictures to come!!. Got a network continuity tester from work during the week and today I finally got a chance to sort out the network connections. When I got the 2 connections sorted out, I junked the wireless connection I had setup as it was just too slow. Now I have a nice fast connection back to my main machines, meaning that I can perform backups of avi files etc when I create them on the observatory computer. From the pictures below you can see that the warm room is pretty comfortable, including a couple of office chairs, desk, the new AMD XP 2400 OCUK PC, phone line, an old 17" gateway monitor and a pair of old PC speakers I had lying around. Also hooked up the PC to the scope for the first time and got Skymap Pro and the Meade LPI and ASU software running without problems. While I was at it, I updated the LX200 firmware to v2.0i. The whole warm room setup should make all the difference once the long nights and cold weather return. Also show below is a picture of the telescope in the main observatory. You can see one of the spotlights which I have on both sides of the observatory. You can also see the temporary power socket on the pier while I await a 6 gang socket which the electrician has on back order. 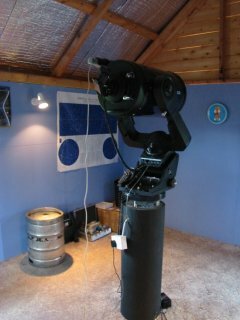 Also in the background are some star charts, my "Homer" clock, a battery charger and Solar filter from Telescope House, my collection of eyepieces and the dew shield. On the pier plate, you can see the Scope Sleeper dongle from Telescope House which I have not had the change to play with yet. I had to send the solar filter holder back to Telescope House, as they sent out a version for a 10" LX200 instead of 12". When it got dark, I started to improve the polar alignment using the iterative procedure in combination with the LPI web cam and the Drift Explorer tool in K3CCD. I managed to get 0.0 arc seconds movement in declination over a period of c. 10 minutes. I was also clearly able to see the periodic error in RA which I should be able to train out using the PEC feature of the scope. What I would really like is a PC program which could take the errors as logged by K3CCD and directly update the PEC table in the scopes firmware. That way there would be no need to try to guide the scope, when doing the PEC training. If you know of such software, then please drop me an email to let me know. 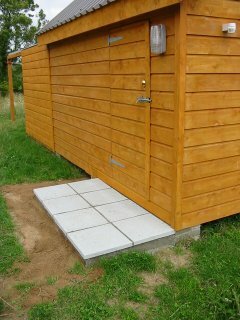 Created a step outside the door of the observatory using some paving slabs and concrete. It puts the finishing touches to the entrance of the observatory. Also installed the flashing where the warm room roof meets the gable end of the observatory. This step finally makes the warm room completely waterproof. Also put some grease on the wheels used on the roll off roof. This makes it much easier to open and close. 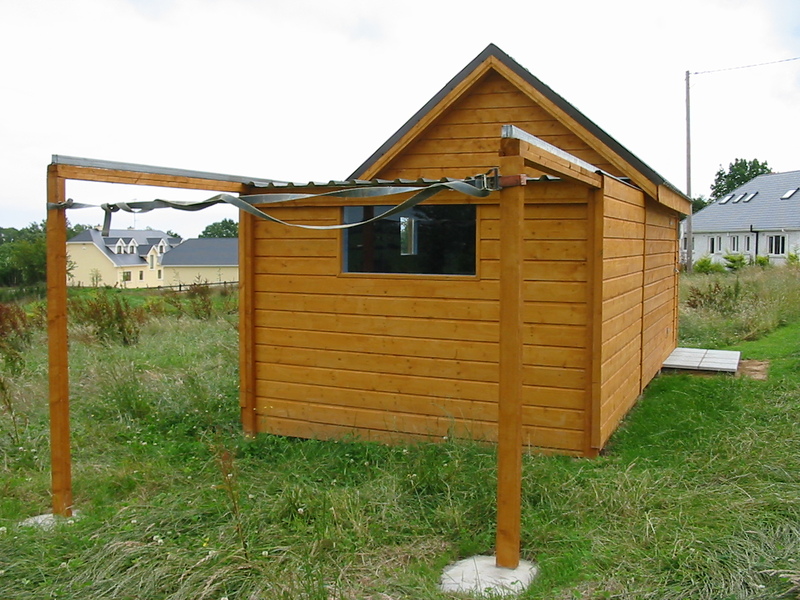 You will also see a temporary strap across the posts which make up the run off for the roof. This keeps the joists parallel as they have warped a bit since they were installed. I should be able to come up with a more permanent solution for this later. Also completed concreting the posts, as they were not completely finished when we initially installed them.